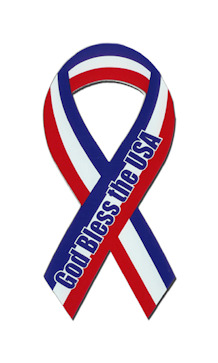 HomeChristian Products"God Bless the USA" Ribbon Mini Magnet - 2" x 4"
"God Bless the USA" Ribbon Mini Magnet - 2" x 4"
This 2" x 4" RWB ribbon car magnet is manufactured and printed in the USA. We print on premium quality, super-thick (.030) magnetic material with top quality, UV protected inks. American Flag Car Magnet - 6.5" x 12"
Perfect way to display your patriotism & add a prayer for the country!